Kids between 3 and 4 start understanding the idea that adding one or more objects adds to the number counted, but taking away objects reduces it. 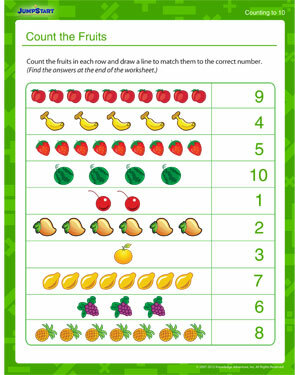 Help your child develop a firm grasp over the idea of counting and numbers through this free fun counting worksheets for kids. We’ve tried to make it more interesting for your little one by putting in some colorful fruits. And when he’s done, have him do this Count the Shapes worksheet too!